As some of you may recall, Maribro repped you guys last year. - You may decide yourselves how you want to elect your representative, but we highly recommend some sort of democratic process (public nominations followed by a poll usually works out well). - In addition to electing a representative, you should also name an alternate who will be asked to step in if the first choice needs to back out. - Your representative should be prepared for having to read upwards of 500 posts per 24 hours during the early stages of the game. Additionally, there’s a requirement that each player must make at least 10 posts per Game Day. Only active players should apply/participate. I repeat: Your chosen player needs to be able to promise a good amount of activity on a daily basis. - 170 communities will participate, each sending one representative. - 10 Qualifying Games will be played, consisting of 17 players each. I.e. every representative plays in one Qualifying Game. The players themselves vote post-game to determine who is deserving of advancement. 1st place will advance directly to the Finale Game (i.e. 10 of the 17 finalists are found this way), while the 2nd places will advance directly to one of the two Wildcard Games. - A Jury consisting of finalists from Season 4 will discuss and vote to determine 25 players in total deserving of a second chance: 1 will advance directly to the finale, and the 24 other players will play in 2 Wildcard Games along with the 2nd places that advanced directly to these. From each game, three players will directly advance to the Finale Game based on a post-game player vote. - The Finale Game is played. Once it has completed, the players vote to determine who shall receive the title of Season 5 Champion and a winner’s certificate signed by Dmitry Davidoff, the creator of mafia. 2) Tag one of the red or blue people in the chat (write @Thingyman or @staff for example), let them know who you are and from what community, and they'll give you the necessary permissions to see the spectator channel. This is necessary to avoid the wrong people (the representatives and their backups) joining the channel. The Championship Game Has Begun! Maybe a chance to talk with the founder of mafia. That was the prize season 1. I'll ask him if he's down again. HydroPimp has confirmed to me that he isn't interested. - 135 communities are participating. Each community elects one representative to send. - This will be the fourth season. More than 160+ different communities have participated in previous seasons. 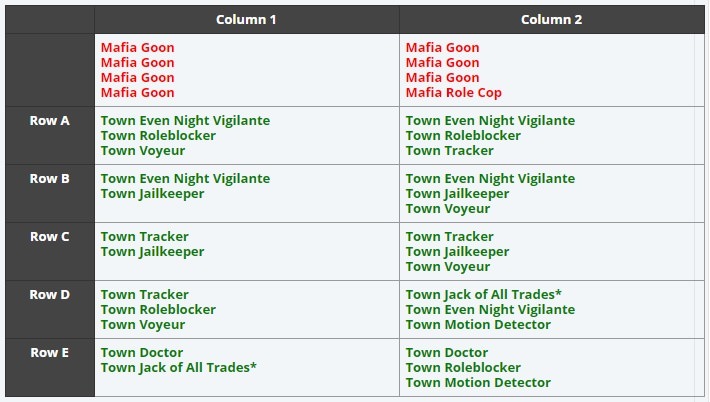 - The setup for this year is: 15-man Mountainous (3 mafia goons vs. 12 vanilla townies). This year we're trying pure mafia. You just have your reads and/or your manipulative abilities to count on. - Your representative should be able to deal with a lot of activity on a daily basis. The first few days you should expect maybe 500+ posts per day. And you need to make at least 10 posts per Day Phase. - Re: starting date, that's up to your representative. There'll be 9 qualifying games, and your rep just signs up for one of these. They'll start either late April, May or June. So if your rep has time somewhere during that period, they're good.